Developer Quote: "Finally, a proven, fun and intuitive way to feel smart by increasing your vocabulary using humorous illustrations with audio found in Word A Day Visuals and Audios by VocabAhead." Usually, if you are a heavy reader enjoying multiple books a week, your vocabulary naturally increases because of subconscious learning. However, if you don't have time to read in your spare moments, here's an app that just may help you still get the benefits of increased vocabulary. The wealth of words in Word A Day Visuals and Audios by VocabAhead will cover every imaginable category while the cute images will stick in your mind as you learn. Add to this the audio portion and now all your senses are involved! Select from 5 to 20 words when you answer the quiz. Share your words on Facebook and Twitter. Word A Day Visuals is comprehensive learning with all your senses involved along with a healthy dose of humor. 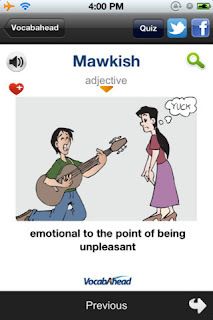 COOL CONCLUSION: Word A Day Visuals and Audios by VocabAhead is a terrific way to increase your vocabulary using humor, audios and even little quizzes to test your knowledge.